And I sort of LOVE it! And I still have no idea what I am going to do to my master bedroom!! I love it! 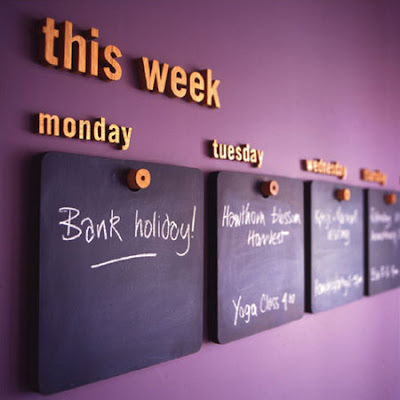 I'm trying to find a way to show our toddler the weekly "schedule"- playdates, outings, etc. She THRIVES on schedules and continuity, but since she doesn't really read words yet, it's been a challenge. Maybe this would be a good way...I could draw pictures of Grandpa, or her friend, or a grocery store...hmmm... :) Thanks! That would be so fun! And cute! So...as far as your master bedroom goes...I own a vinyl cutter (his name is Gilbert so I can yell at him like he is one of my kids)...anyways...maybe for your "pay it forward" gift...something vinyl to go on your walls?!?!? What a neat idea! Thanks for sharing! I would have never thought of anything like that! 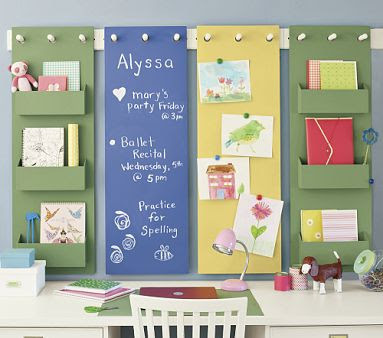 Very cute, although I think I would prefer one big chalkboard where I divided it up myself into areas instead of numerous small ones on the wall. It is a neat idea though! I like that calendar! It's a good way to use up empty wall space- and if I used colored chalkboard paint, it would add some much-needed color to my white apartment walls. I think I may actually make these!